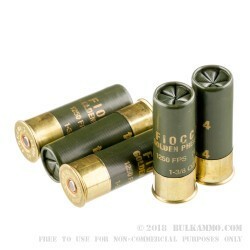 Created to be one of the most effective pheasant and large bird shotshells on the market, Fiocchi’s Golden Pheasant line features nickel-plated shot at higher velocities and is one of the the best terminal performance shells available today. 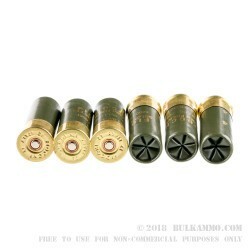 These 12-gauge shotgun shells are loaded with 1⅜ ounces of #4 nickel-plated shot and are capable of a muzzle velocity of 1250 FPS. The nickel plating ensures more consistent shape and uniformity but also allows for a harder, less deformed shot before impact, while the specialized wad ensures tighter patterns at distance than traditional shells. Hunting pheasant is already a challenge without worrying about your shotgun shells performance. 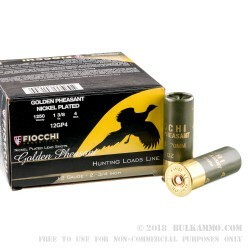 Each box of Fiocchi Golden Pheasant shotshells comes with 25 rounds and there are 10 boxes in each case. Since 1876, Fiocchi has been a world leader in ammunition production. 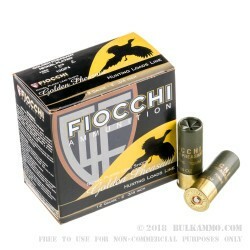 A popular choice among professional and casual shooters, Fiocchi uses only the highest quality components to create exceptional, high-performing ammunition for whatever the application may be.